It all started with an idea over fifty years ago: Revolutionize one of the essential must-have accessories for any guitar player, the capo. To this day, Milton Kyser's Quick-Change Capo is still the acoustic guitarist's preferred companion. It can easily be moved up and down the neck for fast and accurate key changes while providing steady, reliable pressure across all of the strings. All Kyser Quick-Change Capos are made out of resilient aluminum, built and carefully assembled in Texas! 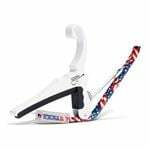 American Musical Supply is excited to be your stop for Kyser guitar capos and accessories ! We offer True 0% interest payment plans – applying is easy and there is no credit check for our 3-pay plan on purchases from $49-1,500. Use your own debit or credit card, enjoy fast and free shipping, and add Kyser products to your creative setup.